Crocktober continues and it just keeps getting better! Today's recipe is quite possibly one of the best meatloaves I have ever made. I've seen where people make meatloaf in the crockpot, and I knew I wanted to try it. However, I have a great Classic Meatloaf recipe on this blog, so I wanted to try something different. 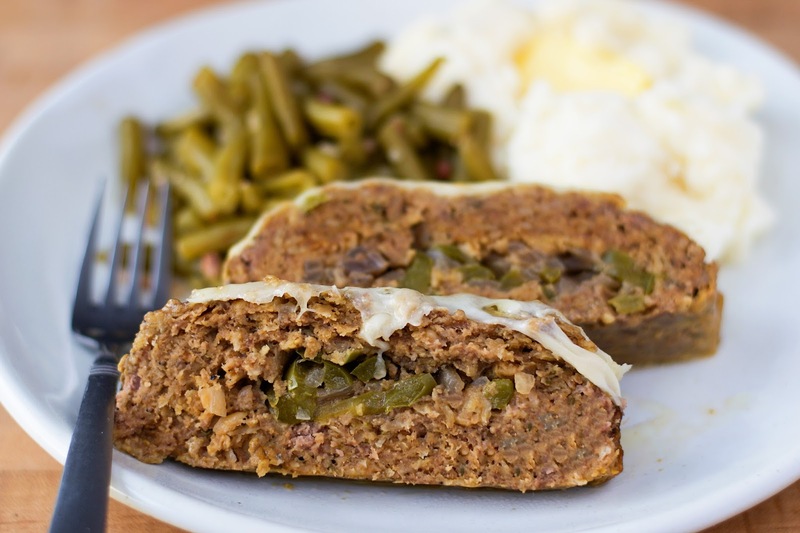 Then it hit me, CROCKPOT PHILLY CHEESESTEAK MEATLOAF! To begin you will need to thinly slice your pepper and onion. Now this next step is entirely optional. Is it nessecary for the dish to turn out? No. However, I think the added flavor is worth it. In a pan, over medium/high heat, with a little oil, cook the pepper and onion for about 10 minutes. Once soft and translucent, season with a little salt and pepper. In a bowl combine the ground beef, onion soup mix (this gives the meatloaf that rich flavor we love in a good Philly cheesesteak sandwich), oats, eggs, salt, pepper, and thyme. With your hands, gently combine everything together. You want the meat mixture to JUST hold together. If it is too dry and brittle add a little more milk. If it is too wet, add a little more oats. Once you have your mixture just right, you're going to place it on a cutting board and pat it into a large, rectangular, patty. Add the pepper and onion to the middle of the meat. Then, fold the meat up and around the pepper and onion. Be sure to pinch the ends together. After that you will need to line your crockpot. I was out of my Reynolds liners so I used parchment paper. You can also use foil. This is important because you will need the liner to lift the meatloaf out of the crockpot once it is finished. Next, gently place the meatloaf, seam-side down, into the crockpot. Tuck the parchment paper into the crockpot and cover with the lid. Once you have done that you can turn your crockpot on LOW and set it for 3 hours. I'll be honest, I ended up cooking mine for 4. After 3-4 hours, check the internal temp of the meatloaf. It should read 160. Place your desired amount of cheese over the top of the meatloaf, cover, and let melt. Once the cheese has melted, simply use the parchment paper to lift the Philly Cheesesteak Meatloaf out of your crockpot, slice, and serve! You guys, the flavor of this Crockpot Philly Cheesesteak Meatloaf is OUT OF THIS WORLD! Rich, hearty, everything you would want out of a classic Philly Cheesesteak Sandwich and a meatloaf combined. The peppers and onion permeate the beef with all sorts of great flavor and the cheese...do I really need to say anything else? I served this with some mashed potatoes and green beans, but a salad would be great too. I'm still amazed that this culinary work of art came out of my crockpot. You are going to want to try this for sure! Remember, if you make this recipe or any from Crocktober, be sure to tag me using the hashtag #CrocktoberwithTheKitchenWife! PS- You can totally make this in your oven. Just bake @ 350 for 1 hour. Thinly slice the pepper and onion. In a mixing bowl combine the ground beef, onion soup mix, oats, eggs, salt, pepper, and thyme. Add the milk to the meat mixture. Place the meat mixture on a cutting board and press out into a flat rectangle. Add the pepper and onion to the center of the meat patty and fold the side up over them. Be sure to pinch the ends together. Line the crockpot with a liner, foil, or parchment paper. Place the meatloaf into the crockpot, seam-side down. Cover and cook on LOW for 3-4 hours until the internal temperature reads 160. Cover the meatloaf with the provolone cheese, place the lid back on the crockpot, and let melt. 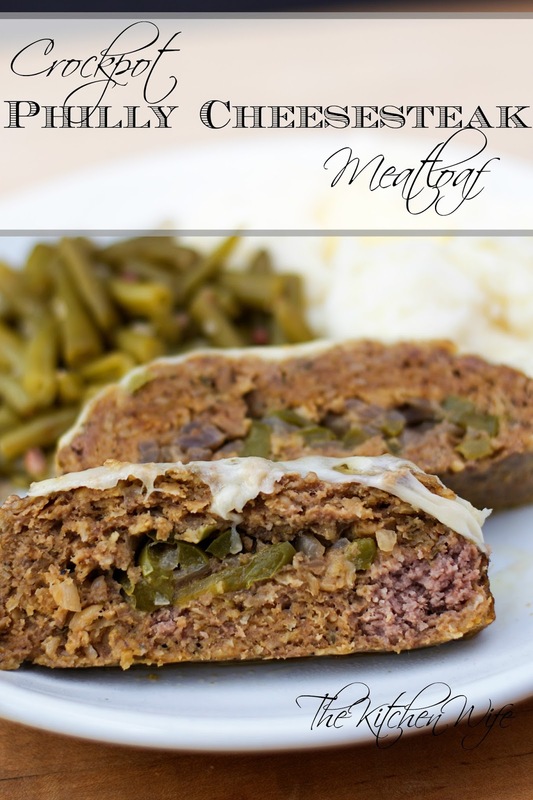 Lift the Philly Cheesesteak Meatloaf out of the crockpot, serve, and enjoy! *This is not a necessary step, but one that I think is worth it. **If the mixture is dry and brittle, add more milk. If it is too wet, add more oats. I can attest to the fact that this is husband approved AND leftovers are AMAZING! lol I can't wait to hear what you think!